The family is now complete, with my sister-in-law and brother’s girlfriend joining the Arndt family at Mirissa beach prior to heading east along the coast to our next hotel in Tissamaharama (or as we prefer to call it, “Tissa”). It’s 6.40am and we’ve woken in our cottage, opened the French doors and looked out over several kilometres of rice paddies that lead to a mountain in the distance.The mountain is covered in jungle and appears to have been dropped by Lord Buddha (we are close to one of the largest Buddhist shrines in the country) on the landscape. We are listening to the sounds of assorted birdlife tweeting and chirping as they bounce around the branches of the tree that shades our veranda. 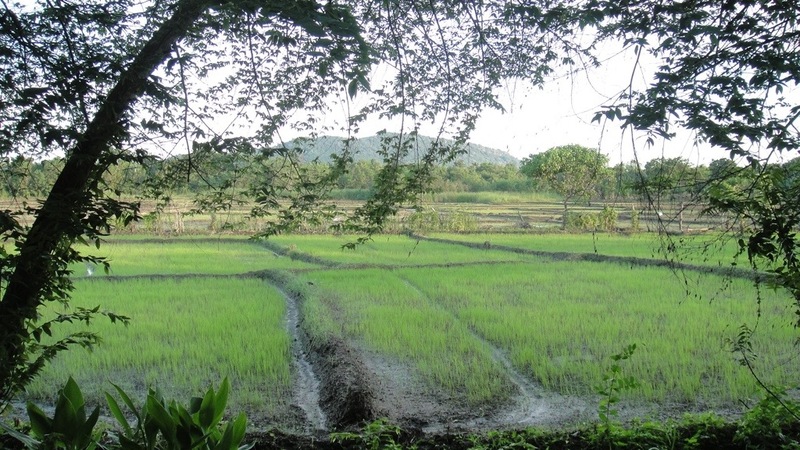 The rice paddies are alive with more small white and green birds sifting through the mud looking for breakfast. In the background we can hear the mournful sound of the peacocks calling out to their mates. We discovered yesterday when we took a safari jeep through nearby Yala National Park that the peacock is native to Sri Lanka and extremely abundant. 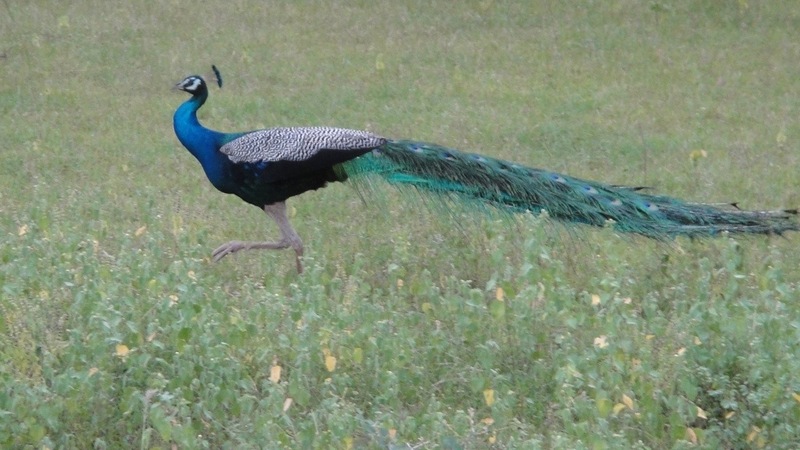 When we spotted our first few peacocks, it was a mad panic and whirl of camera shutters (artistic licence – digital cameras just don’t have that familiar click and whirl) as we tried to get the proud fan of peacock colour; after the twentieth sighting the poor things didn’t even rate a comment! Yala is a 1268 square kilometre national park and home to everything from peacocks, sloth bears, mongoose, leopards, water buffalo, deer, crocodiles, elephants, wild boar and assorted bird life too numerous to mention by name, to dozens of safari jeeps filled with camera crazy tourists all trying to spot the elusive leopard or elephant. This is our second visit to Yala. Last time we did an early morning safari, and this time we bumped around on the extremely rough and water logged paths at dusk. We managed to see the usual peacocks, crocodiles, mongoose, hares, horn bills, water buffalo, wild boar, and sambar deer. The elephants and leopard were being very elusive. Mind you, with safari jeeps buzzing around the water holes like flies at a picnic, I don’t blame them! There are approximately six hundred elephants in Yala. An elephant is not an animal easily hidden. Why couldn’t we find them ? I pictured them secreted away in a clearing somewhere in the park, having gin & tonics waiting for six o’clock, Yala’s closing time and the departure of the hoards! Then we finally spotted a juvenile elephant in the bush next to one of the jeep tracks. He was being very discrete and quiet, except for the sound of trees being stripped of foliage. We could hear another somewhere close by but hidden by the jungle. It was nearly six and obviously elephant happy hour was nearly over. On exiting the park, miraculously an adult elephant was taking a photo shoot. It was like Princess Di at a hospital opening, poor thing was blinded by camera flashes. The cynic in me saw a stake in the ground and a rope around one of its legs, so tourists could go away happy, and elephant safari photos could adorn mantlepieces and photo albums around the world. This morning we load up our two vans and head for the hills. Nuwara Eliya. Described by the locals as “little Britain” (not that Little Britain!). Tudor houses, rose gardens and English tea estates. We are to spend Christmas at St Johns Tea Estate bungalow. As this will probably be my last chance to describe our trip due to wifi coverage, I wish you a Very Merry Christmas and Happy New Year from Sri Lanka. 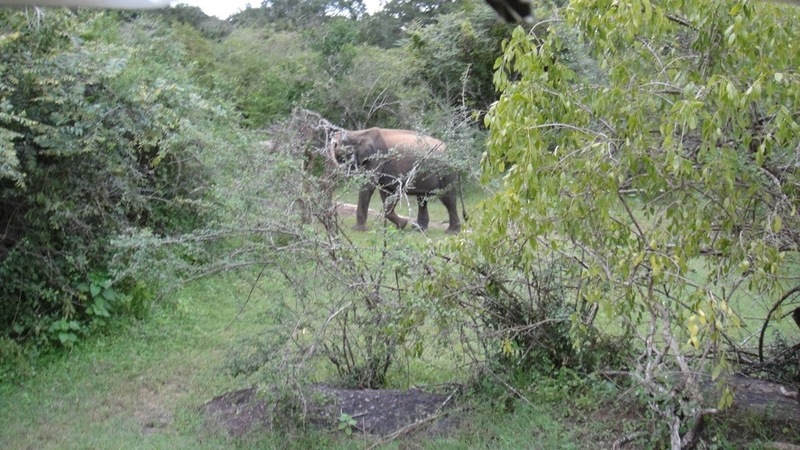 This entry was posted in Sri Lanka and tagged Elephants, Sri Lanka, Yala National Park. Bookmark the permalink.